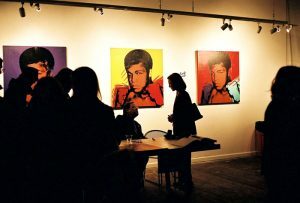 Past exhibit "The Richard Weisman Collection"- "Picasso to POP" in Charlottesville, Va.
Richard Weisman brought the “ALI” series which was painted by Andy Warhol to kick off his new book titled, “Picasso to POP”. Chris Wilmer who is a big part of the Charlottesville, Virginia art scene worked with Weisman to bring the show through Charlottesville. There were 5 local Artists asked to be part of the exhibit and I was lucky enough to be one of them along with my great friend Leo Charre. The show was amazing and to meet Richard Weisman and hang out was super cool, to think, he hung out with Andy Warhol for years and owns more of his original work than anyone in the world! !